1. 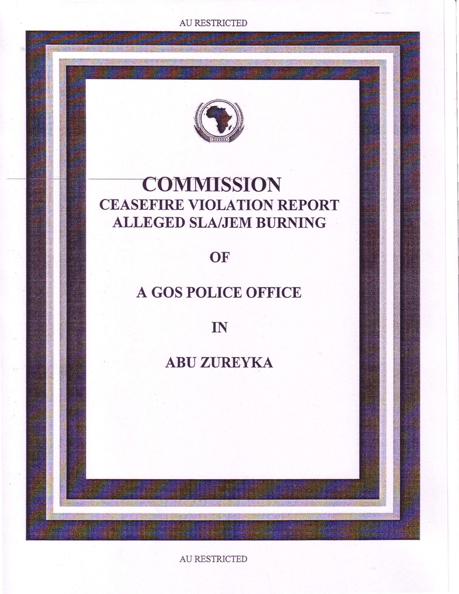 Team 2 was tasked to investigate a GoS complaint alleging that SLA/JEM had burned a GoS police office in Abu Zureyka on 1 Apr as. 2. The team commenced with the investigation on 7 Apr as. 3. The team established that neither SLA nor JEM were responsible for the burning of the GoS Police Office. a. GoS soldiers imposed vehicle road movement restrictions between AI Fashir and Abu Zureyka. b. GoS soldiers extorted illegal taxes on goods the locals purchased and brought to Abu Zureyka. c. GoS soldiers -intimidated and sexually harassed the population. 5. The allegations of burning a GoS Police Office against SLA/JEM could not be substantiated. a. Imposing vehicle road movement restrictions between AI Fashir and Abu Zureyka. b. Extorting illegal taxes on goods the locals purchased and brought to Abu Zureyka. c. Intimidation and sexual harassment of the civilian population. a. GoS should internally investigate and prosecute the perpetrators of the violations. b. GoS should lift the trading restrictions and illegal taxation on the population of Abu Zureyka. 4. The evidence the team adduced from the witnesses interviewed and physical observations made strongly indicate that neither SLA nor JEM forces were responsible for the burning of the GOS police office. The burning could have been done by any of any of the idlers within Abu Zureyka. The team further established from the GOS police and the witnesses that the GOS soldiers in Abu Zureyka subjected the locals to intimidation and sexual harassment. It was further established that the GOS soldiers had not only imposed vehicle road movement restrictions between AI Fashir and Abu Zureyka but had also imposed illegal taxation on the goods the locals purchased and brought to Abu Zureyka either from Nyala or AI Fashir. The humanitarian situation in Abu Zureyka was found to be wanting in terms of food, water and medical care. 5. The team concluded that SLA and JEM forces were not responsible for the burning of GOS police office in Abu Zureyka as it had been alleged by the western area military command. a. The GOS western military command should internally investigate the conduct of the soldiers in Abu Zureyka and disciplinary action be meted against those who have been molesting and harassing the innocent civilians. This move will riot only win back confidence from the civilians but will also act as deterrence. b. The GOS should lift the trading restrictions it has imposed and put a stop to the illegal taxation and extortion currently in effect; this will be in line with the provisions of Article 2 para 8 of the N’djamena HCFA. c. The sector CIMIC officer should take up the issue of the humanitarian assistance required in Abu Zureyka with FHQs and OCHA .